Looking for fun kawaii coloring books to help you destress after a long day at school? These are definitely the cutest anime & manga coloring books around! First, though, let’s talk about what “kawaii” means! Affiliate links included below. If you make a purchase through these links, we’ll earn a small commission at no extra charge to you. The word “kawaii” means “cute” in Japanese, but it’s more than that! In fact, it’s an entire culture of cuteness! While Kawaii is a relatively recent trend in the states, it’s existed as part of the culture for generations in Japan. In fact, many of the items that you’ll find for $5, $10 and up in trendy stores now are things that I bought in the 100 Yen store (the Dollar Store, basically) years ago! Of course, $10 is still cheaper than a flight to Tokyo, right? The trend originated as a “cute handwriting” movement when Japanese school girls started writing with mechanical pencils. They’d create little pictures inside large looping letters! Sanrio originally created Hello Kitty as part of the Kawaii movement. You can’t even turn around in a 100 Yen store without running into some sort of Hello Kitty merch! Speaking of Sanrio, there is an entire theme park dedicated to their 50+ cute characters. Kawaii is traditionally a girl thing, but there are boys involved in the culture. They love transforming themselves into Kawaii women! If you’re looking for more fun facts, check out Cool Japan by Abby Jensen. Now that we know a bit more about what kawaii means, let’s check out some fun anime and manga kawaii coloring books! Designs ranging from super simple to super detailed! 2 copies of each image in case you make a mistake. Free digital edition, so you can print out the images as many times as you want. Medium-difficulty designs, meaning they aren’t overly simple yet not so detailed that you need a magnifying glass! Coloring difficulty ranges from beginner to intermediate. 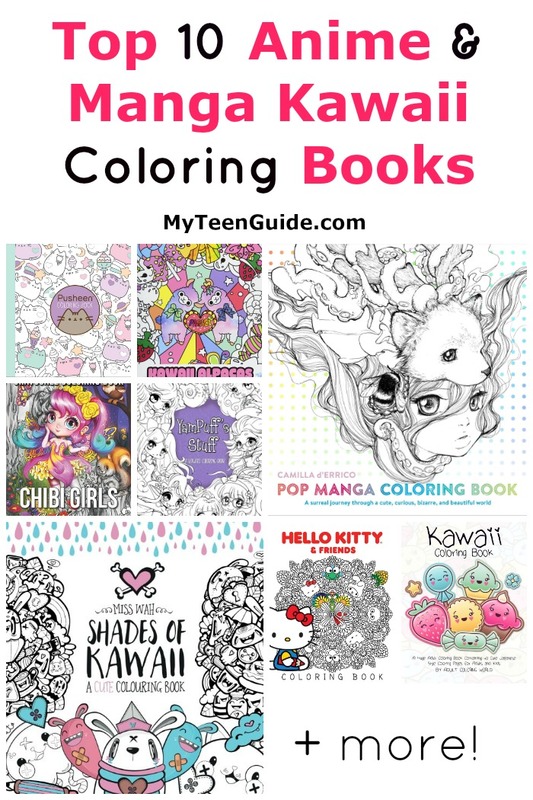 These are just some of my favorite kawaii coloring books! It’s hard to choose the best one, but I am kind of in love with that alpacas book! Ooh, or maybe the cute food! How about you? What are your favorite kawaii coloring books? Tell me below!